Kumkum, jafran, saffron, agnisikha are the name of saffron. Most of the saffron export. Take 10 saffron leaves and put it in one bowl. Mix little water and prepare its ink. If you are suffering with debt then write “Om Shrim Namah” with this ink on bhojpatra and put it in front of god. Use the pomegranate twig to write on bhojpatra. When children get blood from nose then mix pindol mitti or white sandalwood in saffron. If children are suffering with cold in winter then mix saffron in lukewarm milk and drink it. Saffron is beneficial to cure gout problem. Saffron cleans the face. The saffron and turmeric tilak gives good sleep. 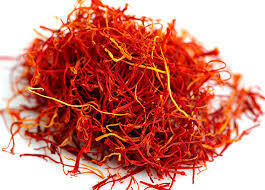 The consumption of saffron gives good sleep. Put one leave of saffron in navel daily. This improves Jupiter. Jupiter gives good result by applying saffron and milk tilak. Saffron increase friendship and love. Spouse should give saffron to each other on marriage anniversary. Use saffron in worship. Do saffron tilak to god. Saffron gift strengthens Moon and Jupiter. The saffron with lukewarm water or milk avoids asthma problem. Saffron is beneficial for pregnant women. It makes fetus healthy.